On May 9, 2010 we set sail on the Freedom of the Seas. Experience a masterpieces of naval engineering, featuring a rock-climbing wall; our FlowRider® surf park at sea; cantilevered whirlpools that extend 12 feet beyond the sides of the ship; the H20 ZoneSM waterpark, complete with interactive sculpture fountains, ground geysers and a cascading waterfall; and so much more! For Oracle cruise details and booking information, now. It's never been easier to book your Oracle training at sea. You book your cruise independently with Royal Caribbean, so you have the full flexibility to choose your own accommodations. This is a full 7-night Cruise with an onboard Oracle DBA class, all for less than the cost of a traditional training class. Cruise prices are at an all-time low, and this is an unprecedented opportunity to combine the vacation of a lifetime with world-class Oracle DBA internals training. In past years, BC has had great success with our shipboard Oracle cruises, a great way to have fun and share valuable Oracle technical information. World class education: BC has some of the top Oracle experts in the world, and this is a not-to-miss class with expert advise for working DBA professionals. Unlike traditional Oracle DBA training, the BC Oracle DBA training is taught by practicing Oracle DBA consultants with decades of hands-on, real-world experience. Bring the family: Your loved ones can share your stateroom for as little as $649++ each, making the BC Oracle cruise the most affordable training option anywhere. Traditional invoicing: Because the training is not at any fixed place, the Oracle class invoices are shown as being conducted in Port Canaveral, where the class begins. 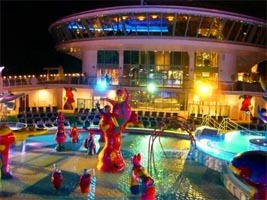 *Based on single occupancy cabin rate for attendee and includes 2 nights of hotel in Port Canaveral. Donald K. Burleson is one of the world's best known Oracle experts and authors. A retired Adjunct Professor Emeritus, Burleson has more than 20 years of full-time DBA experience, authored 32 Oracle database books, written over 100 Oracle articles, and serves as Editor-in-Chief of Rampant TechPress. This is the best Oracle DBA training course anywhere. You will have nearly countless opportunities to interact with your expert instructors, who are also experienced Oracle gurus. Also, the learning environment is substantially enhanced by the "at sea" experience. We are limiting enrollees to ensure that every students get personalized attention. For Oracle cruise details and booking information, send an e-mail to now. Bring your family, sharing your stateroom, combining your training with the ultimate family vacation. This is an unparalleled opportunity to learn Oracle DBA from working Oracle DBA experts. We are only accepting a limited number of attendees, so call and reserve your spot now in this amazing Oracle DBA training.